What does parasthesia mean? Where is your hallux? Tricky words in science sometimes have a really easy alternative – in this case ‘pins and needles’ and ‘big toe’. So why do we sometimes include more difficult terms in our writing? At TextWorkshop we always counsel writers to use the simplest word that works – saying upside-down instead of inverted, and dirty instead of contaminated. It was a good enough approach for Winston Churchill, so it’ll do for us, too. 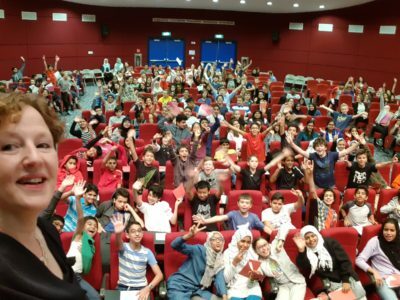 In January, Rebecca had the chance to go to the King Abdullah University of Science and Technology (KAUST) in Saudi Arabia to give a talk on her work in communicating science through exhibitions. She also had a fantastic time in the secondary school there, speaking about persuasive writing with a message, audience and tone, and quizzing the students on their knowledge of words like pulchritude (one of them knew it means ‘beauty’) and octothorpe (it’s a hashtag). Rebecca had the chance to speak to younger students about writing science books.